Starbucks baristas work hard to make you drinks. Granted, they don't work hard to spell your name correctly, but they still deserve a tip! According to reporting by Fox News, a 40-year-old suspect in Roseville, Michigan allegedly tried to steal a Starbucks tip jar... then left his wallet during his escape. After the suspect tried to steal the jar and run out of the store, Fox 2 Detroit reported that a hero customer put the guy in a headlock while his girlfriend stole back the tip jar. The alleged thief somehow lost his wallet in the struggle before exiting the store, giving police a fairly clear idea of who did it. And not only was the superhero-like customer brave enough to fight for the tip jar, he's also hilarious. "He left with less than when he came in. It's the opposite of a robbery basically," he said. The lesson of this crime story is that next time you're in a Starbucks, don't try to steal the tip jar. If you're there and want something for nothing, we recommend this easy hack to get free drinks. 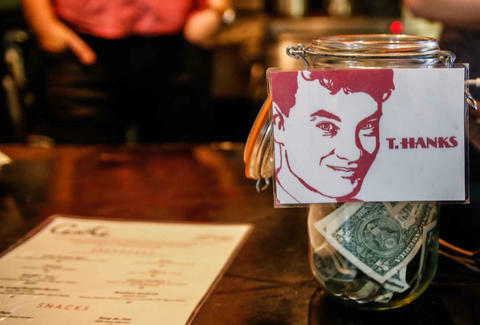 Lee Breslouer is a senior writer for Thrillist, and leaves a tip every time. Follow him to gratitude @LeeBreslouer.